Lock in a great price for Sheraton Imperial Kuala Lumpur Hotel – rated 8.2 by recent guests! The staff was friendly. The room was spacious and clean. The pool and service was excellent. There's a mall across the street and a rail station about five minutes away.. The location was central and convenient. Markets and other tourist attractions are all close by. It’s very near to most well known tourist sites and access by walking. The room. It was very comfortable and clean. The room was well equipped. The breakfast is just stunning! The variety of food is just marvellous and the staff are all very helpful. The cleanliness of the room are also great and also the safety of the hotel is amazing! The staff were extremely polite and always ready to help. It's great. I will introduce to my friends also. excellent selection at breakfast. Facilities in the Hotel are really good. Some building works going on but interruption was kept to a minimum. Really good sized room. very comfortable as well. Sheraton Imperial Kuala Lumpur Hotel This rating is a reflection of how the property compares to the industry standard when it comes to price, facilities and services available. It's based on a self-evaluation by the property. Use this rating to help choose your stay! One of our top picks in Kuala Lumpur.Located opposite Quill City Mall, just a 5-minute drive from Kuala Lumpur Monorail Station, Sheraton Imperial Kuala Lumpur Hotel offers accommodations amid the hustle and bustle of Kuala Lumpur's city center. It features an outdoor swimming pool and guests can enjoy meals from 5 of the in-house dining options. Free WiFi is available throughout the property. Easily accessible via the Light Rail Transit (Dang Wangi Station) or Monorail (Medan Tuanku Station), Sheraton Imperial Kuala Lumpur is 15 minutes' drive from Chinatown. It is only a 10-minute drive to Bukit Bintang and Central Market. HSC Medical Center, Prince Court Medical Center and National Heart Institute are all withing a 15-minute drive from the property. Kuala Lumpur International Airport and Kuala Lumpur International Airport 2 (KLIA 2) are both an hour away by car. Modern rooms are fitted with a walk-in wardrobe, safe and ironing facilities. Private bathrooms include a bathtub and free toiletries. Guests can approach the 24-hour front desk for currency exchange, tour arrangements and concierge services. Guests can work out at the Sheraton Fitness Center or pamper themselves at the award winning Mandara Spa. Italian cuisine is served in Villa Danieli while Essence serves international cuisine. Chinese cuisine is featured in Celestial Court Restaurant. Drinks are served in Pavilions Lounge. 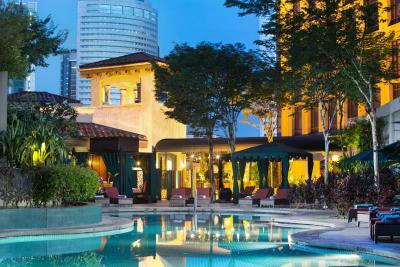 When would you like to stay at Sheraton Imperial Kuala Lumpur Hotel? Public parking is available at a location nearby (reservation is not needed) and costs MYR 8.50 per day. This twin room features a tile/marble floor, bathrobe and mini-bar. This double room has a electric kettle, flat-screen TV and mini-bar. This twin room features a bathrobe, air conditioning and mini-bar. This double room features a kitchenware, electric kettle and air conditioning. 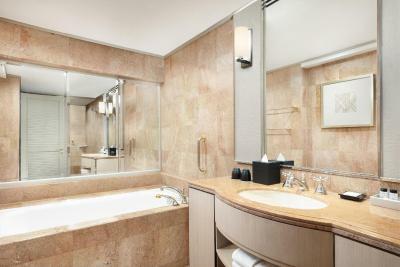 This suite has a tile/marble floor, mini-bar and kitchenware. This suite features a kitchenware, air conditioning and bathrobe. This suite has a flat-screen TV, electric kettle and bathrobe. This suite features a tile/marble floor, seating area and electric kettle. House Rules Sheraton Imperial Kuala Lumpur Hotel takes special requests – add in the next step! One older child or adult is charged MYR 93 per person per night in an extra bed. One older child or adult is charged MYR 139.20 per person per night in an extra bed. Sheraton Imperial Kuala Lumpur Hotel accepts these cards and reserves the right to temporarily hold an amount prior to arrival. Parking have to pay not like others hotel free parking n the everyday hotel kep on charge servis caj n etc . Breakfast was delicious and expecially egg thosai was very nice,club lounge staff are great servers. Spacious room. Clean bathrooms. Comfy beds and pillows. Convenient as it is next to a shopping mall. parking are 3rd party. Had to pay daily rate for parking. Front desk seem to be incompetent. Request parking ticket for going out and staff just stem it without asking weather Im the hotel guest. When i told her that Im stay at the hotel, she take back the parking ticket and gave me another ticket. When check out, I did requested to split room and parking invoice they noted and gave me the invoice with envelope. When arrived at home and open it, I got room invoice for my 3 days stay and just 1 day parking invoice! Falling in love with the comfy bed! One thing I knew about, but did suprise me anyway, were the service charges. I'd like to know about these things upfront as it still is 10% on top of the other government charges. The location is a bit off centre, but just install grab and take an asian uber anywhere..
Amazing staff; extraordinary breakfast (especially the fresh juices); overall, the best hotel we had in Malaysia. The hotel overcharged us and despite sending several emails they haven’t even bothered to respond! Not acceptable for a Sheraton Hotel. Good location/ Helpful Staff/ Clean Rooms/ Big Rooms/ Good Room Service. I was harassed by a bunch of rowdy drunk from the club in the hotel right by the entrance itself on my way out for supper late night. Mind me this took place in the vicinity of the hotel compound itself. Wow. You should really take pride in what you allow Sheraton. Now the matter does not stop there, when I got back from having my supper me and my kids had walk tru the same bunch of drunks sleeping on the side walk. Is that what the dictionary of Sheraton call classy…I have video that I would sent to Sheraton/STARWOOD. Upload on youtube as proof. You guys must be out of your freaking mind you know that. The worst stay ever.